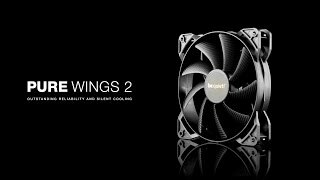 Pure Wings 2 | 120 mm PWM silent essential Fans from be quiet! Pure Wings 2 120mm PWM fans bring famous be quiet! silent cooling to entry level computing, yet are also appropriate for gaming and multimedia systems. Pure Wings 2 120mm PWM fans offer outstanding reliability and quiet operation at great price-for-performance ratio. They are the ultimate reason to put well-known be quiet! silent cooling in your PC. The Pure Wings 2 120mm PWM fan operates at only 20.2dB(A) even at maximum speed. The perfect choice for silent home and office PCs as well as gaming and multimedia systems. Thanks to its surface-optimized fan blades the airflow is enhanced, noise-generating turbulences are minimized and the air pressure is increased. This feature is the key to effective cooling. Pulse Width Modulation (PWM) allows compatible 4-pin controllers - including those built into many motherboards - to intelligently vary the speed and thus the noise level of the fan. With PWM your system can ramp up the cooling when it’s needed, or operate in maximum quiet mode when it’s not. This feature especially recommends the fan for heat sinks and radiators. The Pure Wings 2 120mm PWM is the hallmark of outstanding reliability. This is achieved by its high-quality rifle bearing technology, which assures a very long lifespan of up to 80,000 hours.